Donald Trump’s latest tweetstorm definitely wasn’t vetted by his lawyers. It's morning in America, which means a wild tweetstorm from the nation's Commander-in-Chief. Even more than usual, the cyber decrees from the highest office in the land do not appear to have been vetted by his lawyers, because the president just confirmed reports that he was being investigated for obstruction of justice. Sad! "The man who told me to fire the FBI Director" presumably refers to Deputy Attorney General Rod Rosenstein, who wrote a condemnation of fired FBI director James Comey, but Trump said it didn't matter, he was going to fire him anyway. Also, fact check: Special Counsel Robert Mueller is the one doing the investigating. Just last night, Rosenstein, the top Department of Justice official overseeing the Russia probe since Jeff Sessions recused put out a really weird statement, presumably at gun point. Rosenstein basically said "Don't necessarily believe the leaks, such as the one that says the president is being investigated for obstruction of justice. Well today, it's no longer an anonymous allegation because the president just announced it himself. Nice! Like any aging rock star, Trump also, of course, played the hits: Witch Hunt, Fake News, etc. 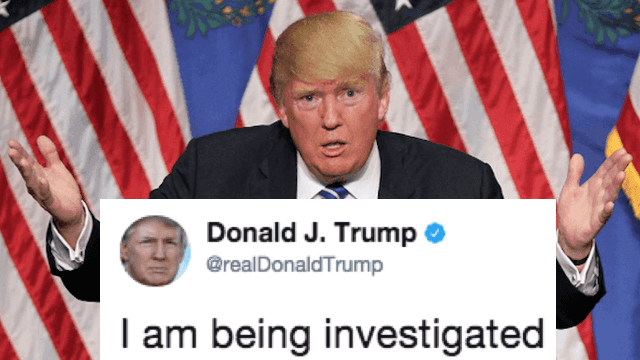 The Fake News media loves when Donald Trump uses Social Media — it confirms investigations into his crimes to over 100 million people!